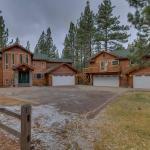 The Black Bart House is located in South Lake Tahoe 2.8 km from Heavenly Ski Resort 3 km from South Tahoe Ice Arena and 4 km from Tahoe Queen. Guests staying at this holiday home have access to a fully equipped kitchen. The holiday home includes 7 bedrooms and a living room with a TV. Private parking is available at the holiday home. At The Black Bart House guests are welcome to take advantage of a fitness room. This property features BBQ facilities. Washoe Meadows State Park is 6 km from the accommodation. The nearest airport is Reno-Tahoe International Airport 68 km from The Black Bart House.